Every REST request is parametrized by a resource path that uniquely identifies a server-side resource. The REST identifiers are intended to allow clients to intuitively consume server-side resources. The KijiREST API version is placed at the root of the resource path as the API entry point. Prefixing the resource path with the version in this manner results in graceful upgrades. A Kiji cluster contains Kiji instances. To avoid name clashes with other direct child resources of the Kiji cluster resource (that is, with the version resource), all instances are grouped into a sub-collection named "instances". This resource serves as a namespace for all instances on this cluster. 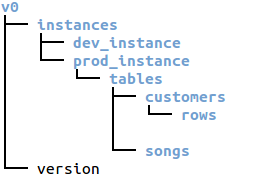 Every instance contains a collection named "tables". It serves as a namespace for all the tables in this instance. Every table contains a collection named "rows". The Kiji resource chain induces a simple directory tree analogy where directories represent collections of resources.